That's right. The long awaited film adaptation of the beloved graphic novel has arrived. So was it worth it? Do the fanboys really have a reason to get their geeky spandex costumes in a bunch? To tell you the truth, I can't answer the latter question because I'm not a fan. In fact, I had never even heard of Watchmen before this film was announced. I've never read the graphic novel, so I went into the film knowing absolutely nothing. I saw it with neutral eyes and gave it a fair shot. All I can tell you is if it worked for me. Well, it did, although I'm saddened to say that I don't think it is as good as everybody is hoping it will be. Watchmen is set in an alternate 1980's, where America is on the verge of nuclear war with the Soviet Union. Due to public outcry, superheroes have become outlawed. When one masked vigilante, the Comedian, is murdered, another hero, Rorschach, working outside of the law tries to unravel a conspiracy to kill off superheroes and tries to warn others. That's the gist of the story, or at least the beginning. I really can't continue onwards because Watchmen creates a deep narrative where the flow of information never stops and to truly explain the plot would be giving too much away. Still, the story is expertly told, working around its slight flaws and the ending packs one hell of a final punch. Without giving anything away, the end really makes you wonder, not unlike Gone Baby Gone, whether or not what happened was morally right. It doesn't just give you a resolution like most movies. It forces you to contemplate the value of life and how far you would go to ensure peace and stability. It's a brilliant story that will captivate you. However, I still have problems with it. While I enjoyed the narrative, it was way too long. The film is about 2 hours and 45 minutes, much longer than it should be. If Wikipedia can summarize the story in five paragraphs, then the filmmakers could have shortened the film by at least half an hour. To be fair though, I must commend the director, Zack Snyder, for attempting to give equal screen time to all of the characters, but the simple fact of the matter is that there were just too many characters for him to juggle. I appreciated that he was trying to give them all personalities because generally, the more time an audience spends with the characters, the more they will care about what happens to them. But the problem here is that some characters are more interesting than others. Dr. Manhattan was fascinating and his rhetoric was philosophical, brilliantly and alluring to the mind. Another great character is Rorschach, the vigilante superhero who exacts justice under his own terms, regardless of what anybody says about him. His story is captivatingly told through film noir style with excellent voiceover dialogue. The rest of the characters, as far as I'm concerned, were considerably less impressive. Although I'm sure fans will appreciate the inclusion of all of the characters, the thoughts of this uninitiated reviewer turned to the desire for more of Dr. Manhattan and Rorschach and less of the others. Another big problem with Watchmen is the somewhat inconsistent tone. Some films can mash different tones together with success, such as a "dramedy" which mixes the saddening tone of a drama with the humorous tone of a comedy. But Watchmen worked best as a dark, gritty film and the switching tone didn't accommodate the rest of the movie. For instance, one scene would follow Rorschach, telling his story through an esoteric film noir, then the following scene would be of the lightheared romance developing between Silk Spectre and Nite Owl. It just didn't play to the strengths of the film. Still, this is a visually arresting film, beautiful in its execution, unforgettable in its brilliance. Zack Snyder has always had a knack for gorgeous visuals and in his short three film career, he has already carved out a niche for himself as one of the most visually profound directors in the business. On top of that, the action was stylish, exciting and not overdone. In fact, much of the film is exposition, but when action erupted, it erupted big. The acting is also terrific. Everybody in this movie was fantastic, especially Jackie Earle Haley as Rorschach, who was easily the highlight of the film. Even Malin Akerman, who has never given a good performance due to her extensive filmography of garbage like The Heartbreak Kid, The Brothers Solomon and 27 Dresses, does a fine job here. As far as acting goes, I can't complain a bit. I have other minor problems with the flick as well, including an excessive use of slow motion (if you were annoyed by 300, wait until you see this) and one line at the end that was too self aware to work in the grounded (albeit alternate) reality, but the film most definitely has more positive traits than negatives. Sure the tone doesn't always work, but the style of the film does. Yes, not all of the characters are equally interesting, but none are dull. The flaws in the film are sporadic, while the strengths are constant. 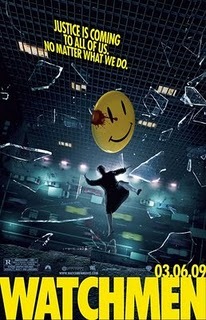 Watchmen is not the best graphic novel film adaptation we’ve seen, but it’s a damn fine flick that deserves a look, regardless of some missteps along the way. Hey man, Its dave from our engl 422 class. I just saw this thing tonight at midnight. And I think overall positive, but there are some serious issues. The age makeup sucked, and it was either too long or two short, what I mean by that is: if it had been edited down with some parts cut out fine, or if they wanted to keep everything in and make it a 2 part movie where some of the scenes actually had room to breathe, and lend emotional impact to what just happened fine. Instead we got something that is both too long and too short depending on how you look at it. The action was cool, and rorschach owned every second he was on screen but there are big missteps. Overall, I enjoyed but man... could have been more. I think you wrote a good review though, watchmen has way less slomo than 300. otherthan that I basically agree. Give me the email of the lady who runs this so I can get in on it. Movies with the beard indeed. oh and that first comment was from me too, just in another account switched so I would actually get the mail if you replied.